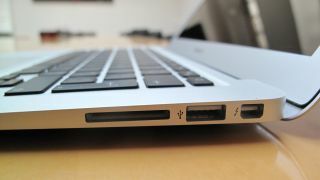 Apple has admitted a fault with the flash drives in some Macbook Air notebooks purchased between June 2012 and June 2013 and is offering free replacements to affected users. The company has issued a product recall for 64GB and 128GB models experiencing hard drive problems and has released a firmware update allowing owners to check if their storage space is on the blink. If after running MacBook Air Flash Storage Firmware Update 1.1 (available to download from the Mac App Store), users will be redirected to the replacement program website if a problem exists. They can then use the webpage to schedule an appointment at their local Apple Store or with an authorised service provider for a free drive replacement. "If your drive is affected, we strongly recommend that you do not install any operating system updates or new applications. We also recommend backing up your data on a regular basis until you receive a replacement drive," read a post on the Apple support website." The company says if users have paid for a refund relating to the issue they can get in touch regarding a refund.